I made these cards as a class project this week. We started off with this simple little card using the scalloped nestabilities with the Bigshot or Cuttlebug to emboss a frame around the stamped flower. A nice simple card for any occasion. This card however wasn't quit so simple. 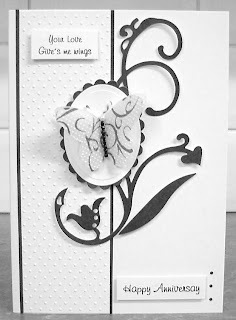 Using the scalloped oval again this time I have half cut and half embossed it, to create this pop out frame. Again I have kept the design of the card simple. I have put this blank card up so you can see what I have done a bit easier. I have just had in some Martha Stewart border punches. As soon as I saw the train border punch I knew I had to have a play with it. I think these range of punches are fab. I hope you like them too. Here is the card I made. I have used Nana's Nursery papers. Don't the little trains look cute. I made my own stamp for the little puf pufs. I used clear stamp material that I cut away, from around a clear stamp. I then used my eyelet setting punch, to punch holes in the stamp material and then made my stamp with the bits that came out of the eyelet punch. My mum always said to me "necessity is the mother of invention." I think she was right. I needed a little stamp for my little train so I made one. Well I hope you like it, why not leave a comment and let me know what you think. I would love to hear from you. Well as we all know it was Valentines Day yesterday and love was in the air. Yesterday my DH bought me a box of Ferrero Rocher ( lucky me ). Being a crafter an idea came into my head for the wrappers. So I didn't waist any time eating them lol ( not all of them I did let my Son have one and my DH. LOL ) I am such a pig when it comes to chocolate. Any way I set about my creation this morning to to see if it would work. The process was very sticky and messy but I love the finished look. Here it is. I made a rose. I used the same technique as the other roses I have made. ( You can see them HERE.) Instead of colouring the paper I covered it with the gold ferrero rocher wrapper, that was the messy part. As you can see in the pic's there are a couple of nicks in places where the foil wrapper has torn, this can be covered up later when completely dry. I am pleased with the result though. I may even leave it, with it's torn edges as they are, for that shabby look. I don't know what I am going to do with the rose yet, maybe it will go on a gift box or I may just frame it I don't know. I was just enjoying myself experimenting and seeing what I would end up with. Well I hope you like it, why not leave a comment and let me know what you think. This card was inspired by the card I made yesterday. The title of the card came to me as I was finishing off the Valentines card. So it had to have a butterfly. I know it is a bit over the top sentiment wise, but is the season of love after all. For the card I used a Sizzix floral flourish die, Cuttlebug Swiss Dots embossing folder and butterfly also nesterbillities oval and scalloped oval. 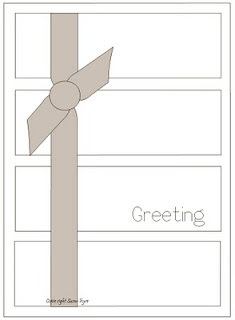 The sentiment and greeting are computer generated printed on to spare card stock, and cut to size. The butterfly is cut from 2 layers of vellum, 1 pattened and one plain. I then embossed them both before sticking them together. I used some black & white beads threaded on to thin wire to form the body. I love the dramatic look of black & white. It's so clean and simple. I hope you like it. Why not leave a comment and let me know what you think. Isn't it funny where inspiration for our cards / crafts comes from. The other night just as I was getting into bed , I looked at the chest of drawers in the bedroom. I had a sudden flash of inspiration, so I lept from the bed, dashed into my craft room ( my DH must of thought I had gone potty) and did a couple card sketches of my idea before I could forget what it was. Then calmly went and got back into bed about 10 minuets later. And here it is the final sketch, first one I drew wasn't quite right. So made a small change.I even knew what papers I wanted to use for the card when I make it. Here is the card just as I first imagined it would look. It is very rare for me to make a card exactly how imagine it to look. Normally I get an idea, start to work on it and then end up with something very different. 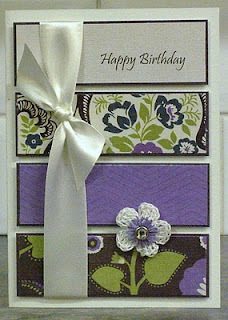 And here is the card made again this time with different colours. On this I have added a crocheted flower with a quilled centre and a jewel brad. Hope you like them. Leave a comment and let me know what you think. Or why not tell me of your flashes of inspiration. I would love to hear them. I have been playing with the Simply Florals clear stamps by Dovecraft. I am really loving these . Here three cards made with the stamps. Im not very good at colouring my stamping so I have stamped onto pretty coloured papers, cut them out then layerd up. On this card I stamped first onto the card stock ( that bit is always scary ) then coloured the leaves with my Kurecolor alcohol based markers ( colour 542). Stamped Happy Birthday along the folded edge. I have used the Cuttlebug Swiss Dots for the embossing detail. On this card I just stamped flowers up onto patterned papers from my stash, cut them out and layered them up, and used the same papers for the bottom half of the card. I used the same sentiment as before. The last card in the set I used the Swiss Dots again, this time over most of the card, leaving a gap for the sentiment. I kept this one very clean and simple. I have loved playing with these stamps and something tells me that these are not the last cards I shall be making with them. My second post of the day. I didn't realise I had so much catching up to do. I just love making these type of flowers, I have made them so many times. Normally I put a brad in to hide the centre. This time though the middle was a bit to open to hide with a brad, so I made a quilled fringe flower to fill in the centre instead. Before I started making this flower, I cut the edge of the strip of paper used, with a scalloped pair of decorative edging scissors. This also helps with the spacing when scoring, to get an evenly folded flower. I just love these colours. I also added a couple of buttons. 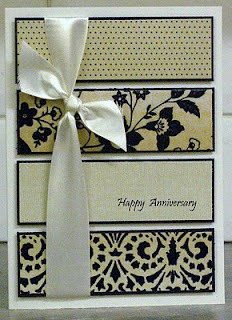 I used Cuttlebug Swiss dots for the embossing detail. Phew!! .... It's been a busy couple of weeks. I have hardly had time to turn around. Things have settled down a bit so have some time to update the blog. For a closer look click on photo. For the last couple of Saturdays I have run a workshop on making the flowers with water colour paper and punched flower shapes. Here are a couple of examples of the cards I made, to show the girls what the finished flowers look like. The flowers you see on my blog page are also made using the same technique. These flowers are so easy to make and look so beautiful, it is a joy to make them. I wish now I had taken photos of what the girls had made in the workshops, because they all turned out fantastic, and we all had a lovely day. So a big thank you to all the ladies for joining the workshop and making it an enjoyable one.